Sometimes we all hit a wall, especially when it comes to social media. Often we feel like we’ve talked about everything we can think of. 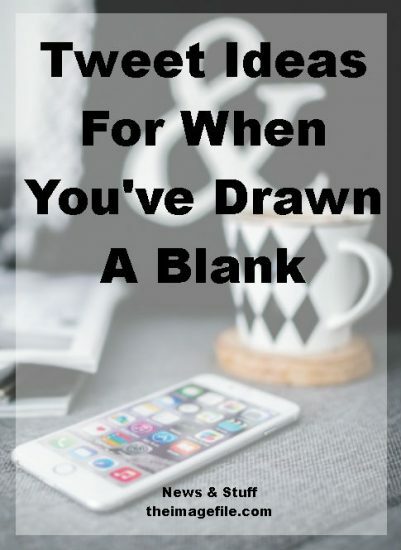 So here are a few ideas to tweet about when you’ve hit a blank. We all like to know what other people are up to, so why not share a behind-the-scenes look at your business. This could be your office or studio, perhaps a snap of your coffee break or even the changing seasons. Chances are that people are following you on Twitter because they feel they can gain something from you. This might be a client wanting baby pictures, or someone who just loves your style. So give them something to learn by sharing a tip or two. You could talk about which prop companies you use or your favourite piece of kit. You don’t have to only share organic content on Twitter. You could share an article about something you agree with in the industry, or even someone you admire. People like to know what you like and we all love a bit of positivity. Share a glimpse of your day-to-day life. This could be anything from a photo of your recent Starbucks order to you with some happy customers. We all like to have a look at other people’s lives. Your Twitter account is a great tool for your business, so don’t be afraid to use it. Maybe your company is coming up to a big milestone? Are you launching a new service or product? Or perhaps you have a promo or discount on offer? If you have a blog then this is a great source of new and old content. Sure you want to keep it as up to date as possible but all those old blog posts collecting dust in your archives are useful too. Why not share one that’s still relevant today? As a customer we all like to feel appreciated and valued, so give an awesome client a shout out! You could say how much you enjoyed working with them and even include a sneaky selfie. Equally, as a business we all like to hear how we’ve helped our clients. So why not highlight a great company or service you use? Maybe they’re just incredibly useful or perhaps they’ve gone above and beyond to help you out? Everyone likes to feel inspired even if it’s not about their industry. Give your followers some eye candy by sharing something that’s inspired you recently. Twitter itself has certain hashtags that are popular every day of the week. These might give you a little inspiration. They include; #MondayFunday, #MotivationMonday, #TuesdayTip, #WednesdayWisdom, #ThrowbackThursday, #FollowFriday and #SocialSaturday. Do you have any Tweet ideas? Share them with us in the comments below!